It is October, which means it is time to turn our gaze towards missionary work in the Transylvania Central Mission. Today's gag features some good old fashion member missionary work. 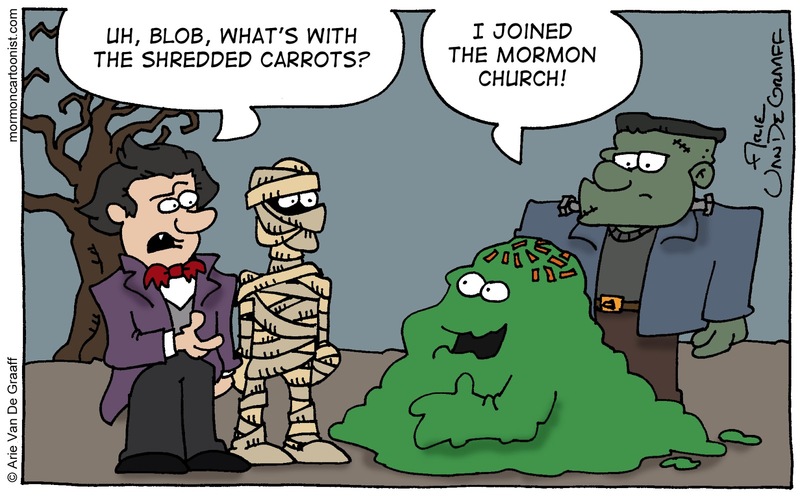 We can excuse Blob for using the old "Mormon" moniker to describe the Church. He's new and doesn't know any better. We can probably be a little less charitable to the publisher of this blog for his continued use of that name, which is why I'll be rolling out a new title for this website a week from today. The thing is, I'm still not sure what the replacement name of this site should be. I'm welcome to suggestions. Please leave your ideas in the comment section. I didn’t even think about your blog name after the prophet spoke. I’m going to be thinking about names for the next week. Take a cue from Prince. The cartoonist formerly known as Mormon Cartoonist. The Ultra Mega Super Neo Hyper Max Cartoonist Deluxe...Max! Captain Cartoonist and the Banner of Hilarity. You could have the Banner of Hilarity be the...I'm not sure what the word for it is, the thing that people associate with you...kinda like a mascot, but for a thing. Another idea...Instead of calling the cartoon after yourself, you could simply call the comic "Funeral Potatoes" or "Green Jell-O", or some name that represents the comic rather than yourself. How about just ’A Peculiar People’? Ooh, I like that one! "Cartoonist of the Latter-day Saints". On a completely different topic, isn't the Blob actually a mutation of the snowman jell-o? i thought it was now "Latter day saints" not "mormon"..